THE STORY - Robin of Loxley (Taron Egerton) a war-hardened Crusader and his Moorish commander (Jamie Foxx) mount an audacious revolt against the corrupt English crown in a thrilling action-adventure packed with gritty battlefield exploits, mind-blowing fight choreography, and a timeless romance. ​​He steals from the rich and gives to the poor. Well, I feel like he stole two hours of my life that I'm never going to get back. "Robin Hood" is everything wrong with the Hollywood studio system today. A big-budget gets shoveled towards a terrible script that gets turned around and made into a god awful film. Front to back, this film has zero redeemable qualities and leaves a god awful taste in your mouth. The characters are all bland and move in no direction whatsoever. While the cast is talented, they suffer from terrible direction and an even more dreadful script. The script is nothing but exposition and has all sorts of problems page to page. The direction is unfocused and completely all over the place. "Robin Hood" may not only be one of the worst movies I've seen this year but in my entire life. 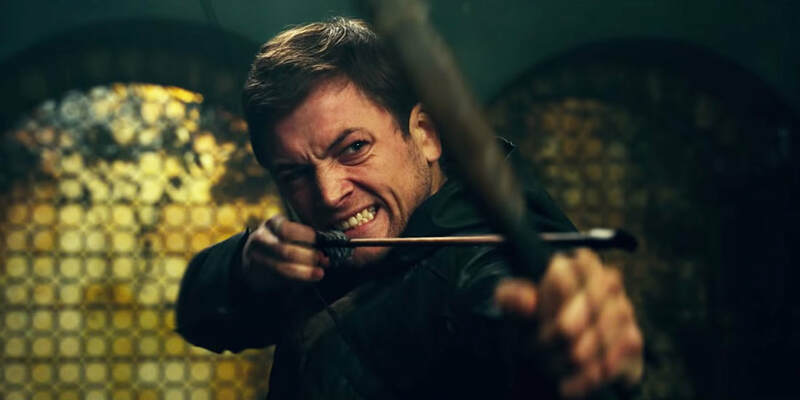 After suffering a life-threatening injury during the war, Lord Robin (Taron Egerton) returns to his home of Nottingham in England to find that his land has been repossessed by the corrupt Sheriff of Nottingham (Ben Mendelsohn). His former girlfriend, Marian (Eve Hewson), has found a new love in Will Scarlet (Jamie Dornan), a self-proclaimed man of the people. Everything in Robin's life is lost. But a man whose son was killed in the war, that Robin tried to stop from happening, has followed Robin home in hopes of training the soon to be the prince of thieves how to hit the Sheriff where it hurts, his wallet. This man is John (Jamie Foxx) and John is going to train Robin to become the greatest thief to have ever lived. The unfortunate part is that the only thing Robin Hood manages to steal is your time and money, which I guess is ironic. "Robin Hood" isn't the kind of bad that makes you want to go see it so that you can laugh at how unintentionally funny it is, nor the kind of bad that makes it achieve cult classic status. No, "Robin Hood" is beyond bad. It's so excruciatingly awful that I would not make my worst enemy watch this film as a form of punishment. The laughter that leaves your mouth is only from the embarrassment that you feel watching a specific scene and going "someone somewhere in Hollywood, who is apart of a major big-budget studio approved of this to happen." There have been some awful big budget blockbusters over the years but this easily takes the cake for most the wanted of all thieves. Let us start off with the acting. The ensemble has several talented faces and names attached. Taron Edgerton, Eve Hewson, Oscar winner Jamie Foxx, Ben Mendelsohn, and even an appearance from Oscar winner F. Murray Abraham. Talented names across the board. But the material that they are forced to work with has quite literally been scraped from the bottom of the barrel. Not only does just about every spoken word of dialogue have some kind of exposition but it just sounds ridiculous. Half of the things characters say make almost no sense, whether it be within the context of the film or the reality in which you and I live in. Not only is some dialogue completely incomprehensible, but some of it is just straight up laughable. The amount of times a single word or phrase is uttered during one talking scene is outrageous. In a scene between Ben Mendelsohn and one of his underlings, I counted him saying the word God, the Lord, or some form of reference to God, 12 times. 12 times! In a minor one minute scene. The film only goes downhill from there. While the actors don't get much to chew on in terms of their script, the direction that they receive from director Otto Bathurst is not the best either. Bathurst, of course, doesn't just lead his actors astray but his camera work and editing are sloppy also with confusing and unmotivated camera moves or shots. There are jumbled and jarring edits that do not help add either tension or emotion to the scenes. This film is kind of heartbreaking in a way because just about all of the elements that get set down on the board are slapped away. It's like playing chess with an infant. While you are attempting to take the game seriously and analyze the next possible move, the infant is breaking the board, chewing on pieces, or even ignoring the game altogether. "Robin Hood" is easily the worst movie of 2018 and one of the worst movies I've ever seen in my life. It goes beyond incompetent to just completely and utterly dreadful. I would rather watch paint dry than watch this film again. A terrible script, lousy editing and cinematography, poor acting, and unfocused direction. "Robin Hood" has literally zero redeemable qualities and cannot save itself from the hole it has dug. If this film somehow makes enough money to warrant a sequel, all hope will be lost. The ending even sets up the film for more installments and if by some miracle enough money is made for that to happen, it will literally be the end of days as we know it.